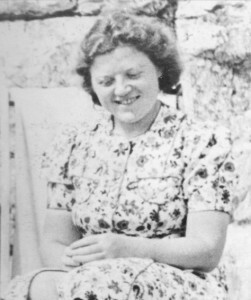 Waldo met Linda Llewelyn when she was on holiday with her cousin, Gwladys Llewelyn at Rhosaeron, Llandysilio. Linda had been brought up in Maerdy, in the Rhondda Valley. She was the daughter of Gwladys’ uncle, – her father’s brother who was a native of Llandysilio. Gwladys’ mother was the sister of Waldo’s father and her parents met and married in America. Mary Llewelyn died following Gwladys’ birth and she then returned from Ohio to be part of the family at Rhosaeron. English would be the predominant language of conversation between Waldo and Linda and his love poems to her were written in English. Their relationship is scrutinised in Euros Lewis’ drama, Linda, (gwraig Waldo) performed by Troedyrhiw Theatre Company. Waldo marvelled at the ability of the inhabitants of Maerdy, at that time, to turn from Welsh to English and back again almost within the same sentence as they spoke. Waldo and Linda were married at Blaenconin Chapel, Llandysilio on 14 April, 1941. He was 36 and she was 29 years of age. It is believed Linda had spent some time teaching in Somerset in the southwest of England. Their first matrimonial home was at Puncheston where Waldo was a temporary headmaster. They moved to the Llŷn peninsula in North Wales early in 1942 when Waldo took up a teaching post at Botwnnog High School. Linda soon became ill and she died of tuberculosis in May 1943. Waldo was heartbroken. He never contemplated re-marrying. When anyone suggested he should take another wife his eyes would be ablaze. He considered himself to be a married man rather than a widower and that death had only separated them temporarily. A small bird above the world’s thorns. Where we walked there was solace. My heaven, my eternal nest.